Location: On the north side of High Street. A public footpath follows the course of the railway at this point. Company on opening: Evesham & Redditch Railway/Stratford-on-Avon & Midland Junction Railway Joint. 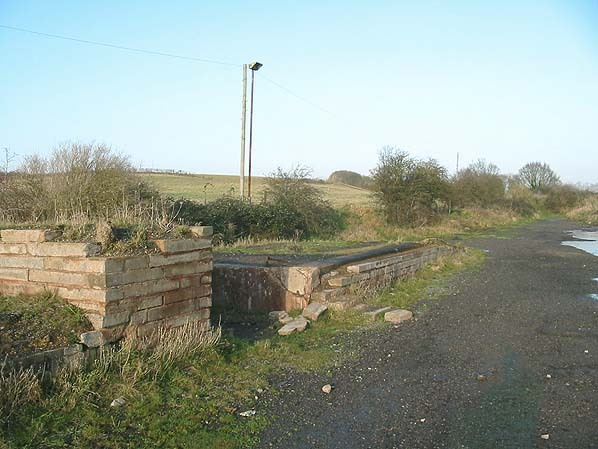 Present state: Remnants of the platform and some brickwork from the station building can still be seen. Notes: In 1873, the East and West Junction Railway (E&WJ) received Parliamentary authorisation to construct a 7.75 miles eastwards extension of its Stratford to Blisworth line to join with the Evesham & Redditch Railway's (E&R) Barnt Green to Ashchurch line which had opened six years previously. The new line joined at the village of Broom where it formed a northward facing junction with the E&R's line. In completing the line to Broom, the length of the Stratford-upon-Avon and Midland Junction Railway (SMJR) was increased to 45 miles, rising to 55.5 miles in 1882 with the completion of a further extension south to Olney. The completed line also provided a connection between two lines worked by the Midland Railway which absorbed the E&R in 1882. 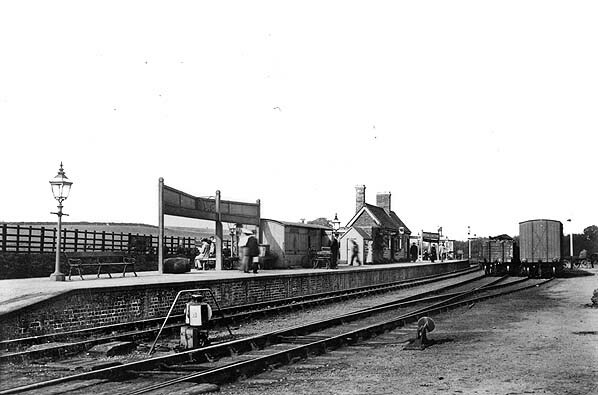 The new line opened to traffic on 2 June 1879 and an island platform was provided at Broom to allow passengers to change trains en route. Trains from the E&WJ worked into a single north-facing platform by an awkward west to north movement, across the main lines. The return journey required a reversal south to the engine turntable situated at the end of a siding on the other side of the road bridge. The Midland allowed the E&WJ to use the station subject to the sharing of costs, and the E&WJ were given running rights over the Midland's line although it only ever exercised use of the 5 chains (330 ft) into the station. Broom first appeared in public timetables in November 1880. 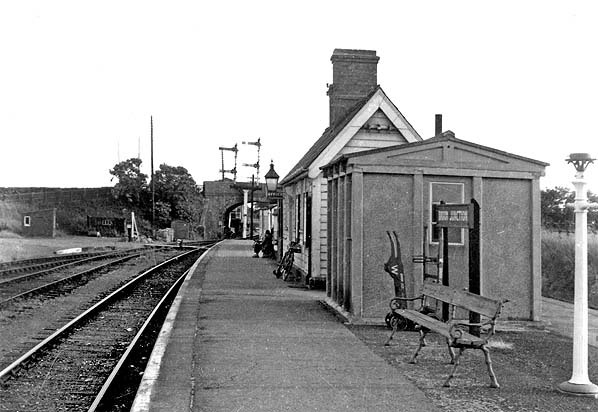 Meagre passenger facilities were provided in the shape of two old coach bodies and a small brick booking office; a sectional concrete shed was added later. 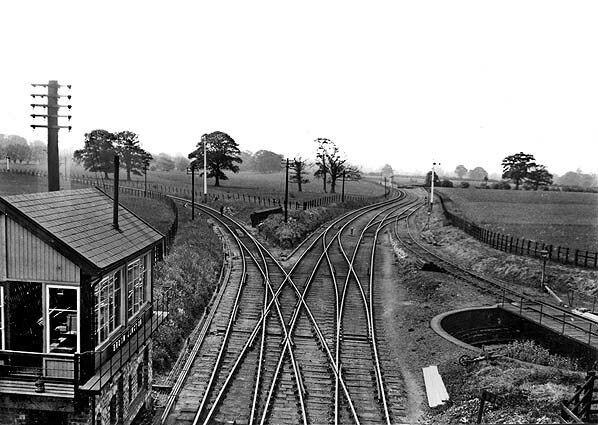 At first two north and south signal boxes were provided, but this arrangement was rationalised in 1934 by the London, Midland and Scottish Railway, which concentrated the junction's workings into one box known as Broom Junction. The advent of the Second World War led to the installation of a south-to-east curve between the SMJR and Barnt Green line to allow through running of Gloucester to London services. 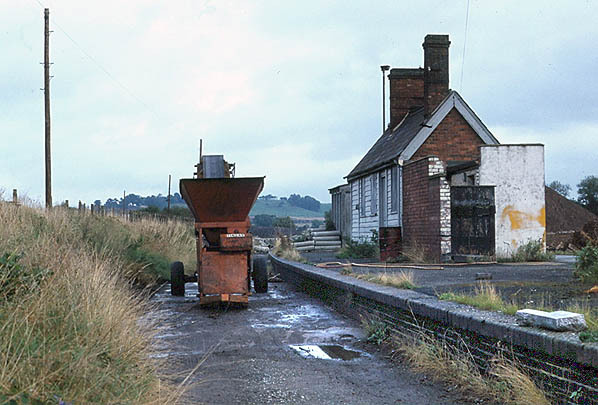 This required two new signal boxes: one on the curve entrance from Stratford known as Broom West, and another on the original connecting line known as Broom East. All three later closed on 5 July 1962. 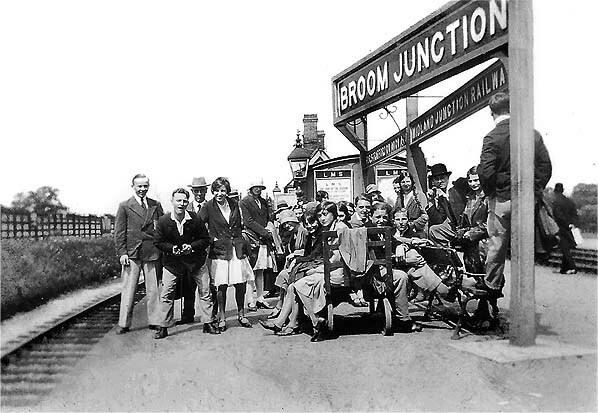 As a passenger station, Broom was not particularly successful: it served a small rural community and was very susceptible to road competition. Passenger services to Stratford were temporarily withdrawn on 16 June 1947 and permanently from 23 May 1949, at which point the station was only seeing two daily workings. Its ghost lingered on in the Barnt Green to Ashchurch timetables until 1962, as the 1pm service from Birmingham New Street to Ashchurch continued to wait at Broom for 20 minutes for a connection which had long ceased (see 1950 Bradshaw below). Goods services between Stratford and Broom continued until 13 June 1960, the freight being diverted via a new south curve at Stratford between the SMJR and Honeybourne line. The Barnt Green line itself closed between Redditch and Evesham from 1 October 1962 due to the unsafe condition of the track; British Railways provided a replacement bus service using hired Midland Red buses, but this was found to be similarly uneconomical and was withdrawn from 17 June 1963. The line between Barnt Green and Ashchurch was built in four stages between 1859 and 1868, providing an essential link for the various communities along it. The main line from Birmingham to Gloucester had failed to serve such centres as Redditch, Evesham and Alcester. The line also formed an important diversionary route running parallel to the main line this was particularly important in the days of steam as the route bypassed the notorious Lickey incline. In July 1858 the Redditch Railway Act authorised a line between Barnt Green & Redditch which opened on 18th September 1859. Authorisation to build the Ashchurch and Evesham Railway was given under the Midland Railway (New Lines) Act of 1861. It opened to goods traffic on 1st July 1864 and to passengers on 1st October 1864. The gap between those two lines was filled by the Evesham and Redditch Railway which was authorised in 1863. The stretch between Evesham and Alcester opened to goods traffic in June 1866 and to passengers on 17th September 1866. The remaining section between Alcester and Redditch opened on 4th May 1868 running into a new station at Redditch 1/4 of a mile south of the original site. From the start the service was provided by the Midland Railway. The Redditch Railway was bought by the Midland Railway in 1865 while the middle section between Redditch and Evesham was taken over by the Midland in 1882. Evesham and Ashchurch there were intermediate stations at Bengeworth, Hinton, Ashton-under-Hill and Beckford. 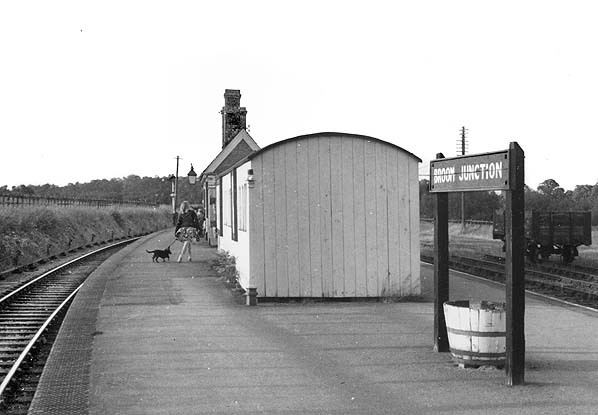 Although some stations on the line had closed during the 1950's. The Evesham to Redditch section of railway line was closed to passengers on a temporary basis on 1st October 1962 because of the poor condition of the track and substitute bus service was introduced. Goods traffic was retained at Studley and Alcester. 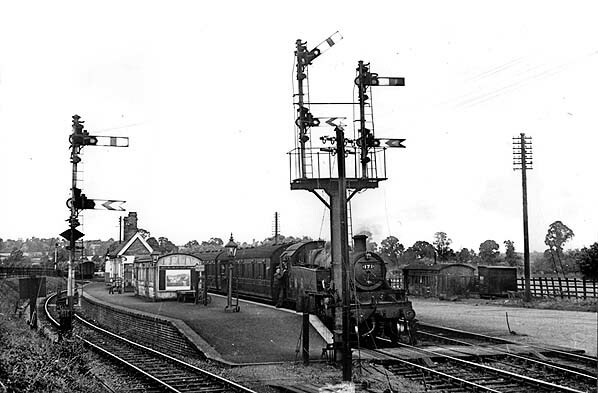 The passenger service between Evesham and Redditch was withdrawn from 17th June 1963 and the line closed completely on 6th July 1964 with the track being lifted by January 1965. On 1965 there was an attempt to close the remaining section between Redditch and Barnt Green but the line was reprieved. 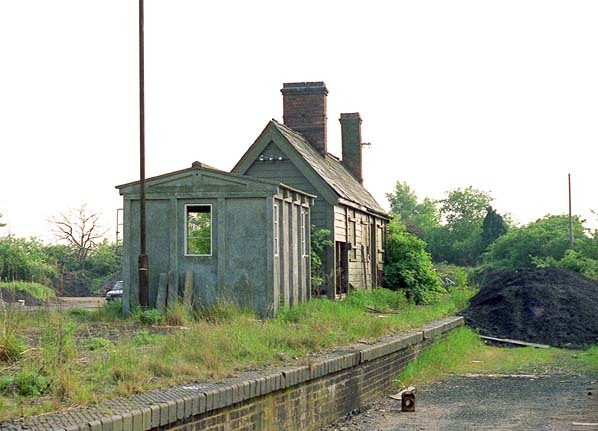 Redditch station was moved to north side of Bromsgrove Bridge into the former goods yard. 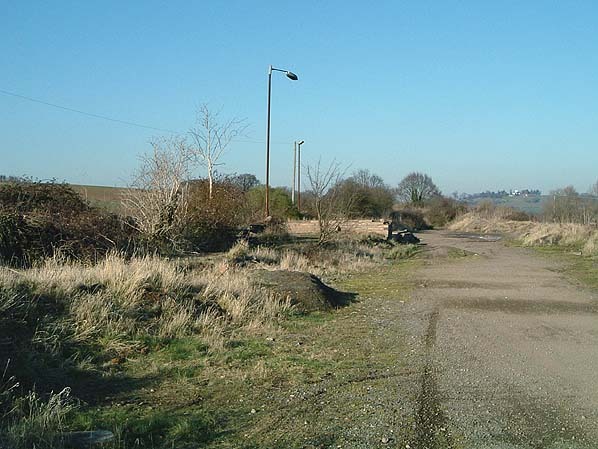 This allowed the former station site to be cleared for the construction of a new bus station as part of the Kingfisher Shopping Centre development. In February 1990 the Cross City Line between Redditch and Litchfield was authorised. 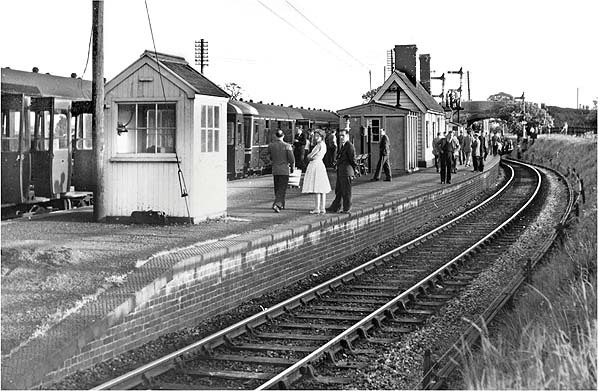 This involved the electrification of existing lines including Barnt Green to Redditch and the rebuilding of Redditch Station, with a new brick station building and an extension to the platform to accommodate 6 car trains. This section of the former Ashchurch line is still open forming an important part of Centro's line to Birmingham New Street and Litchfield. Today much of the former track bed can still be traced; part of the line has been incorporated into the Evesham Country Park while another short section south of Redditch now forms part of the realigned A441. Tickets from Michael Stewart. Route map drawn by Alan Young. Bradshaw from Nick Catford. Some text copied from Wikipedia under creative commons licence. Broom Junction station and goods yard in the early years of the 20th century. Although Broom had two sidings it only ever had a limited goods service handling general goods and parcels. The north signal box can just be made out beyond the platform. 1905 1:2,500 OS map. The two goods sidings are seen opposite the platform. The north signal box is to the north of the station on the down side with the south box on the south side of the road bridge on the up side opporite the turntable. Copyright photo received from Alan Smith. Alan's parents are amongst the group. Looking south from High Street bridge in 1933. The main line to Ashchurch is to the right with the single track line to Stratford on Avon to the left. The South signal box is seen on the left. On the right is the turntable that was used by trains from Stratford that terminated at Broom. Looking north from High Street bridge towards Broom Junction ande goods yard in 1934. The North signal box iss seen in the distance. The limited goods facility is seen on the right; an old coach body is probably being used as a parcels store with perhaps a small brick goods office behind it. Note the wheeled ramp beside the telegraph pole used when unloading wagins and vans. Ex-LMS 171 hauls an Ashchurch or Stratford train awaits departure from Broom Junction in September 1949 in the early years of nationalisation. The loco is a Stanier 3P-B 2-6-2 tank, built in Deecember 1937. It was renumbered 40171 under BR and remained in service until 20 May 1961 when it was withdrawn from Chester shed and later scrapped at Crewe works. Another old coach has appeared on the platform and is in use as a waiting room. Stephenson Locomotive Society (Midland Area) Stratford-upon-Avon & Midland Junction and District Rail Tour at Broom Junction on 14 May 1960. The tour started at Birmingham Snow Hill running via Woodford Halse, Blisworth, Stratford-on-Avon Old Town, Broom, Evesham, Stratford-on-Avon Old Toen and back to Snow Hill. 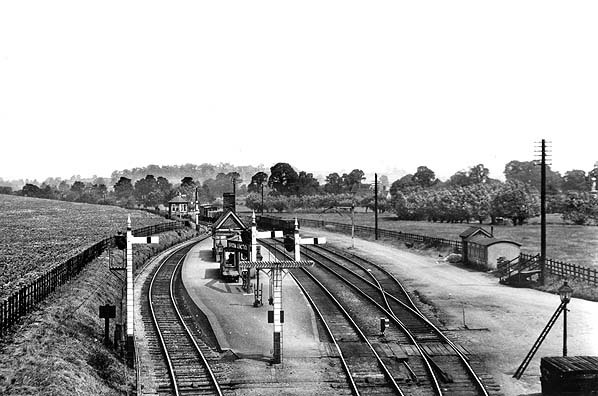 Broom Junction station looking north in the early 1960s. 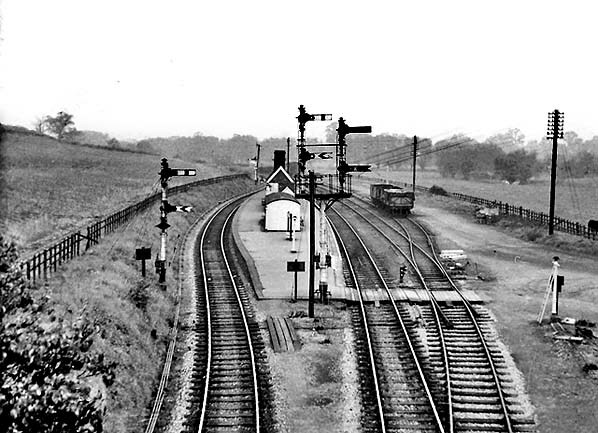 Broom Junction station looking south in the early 1960s.